Everyone wants to go digital for their audio mixing. Whether this is necessarily a good idea for every church is a topic we’ll tackle later. 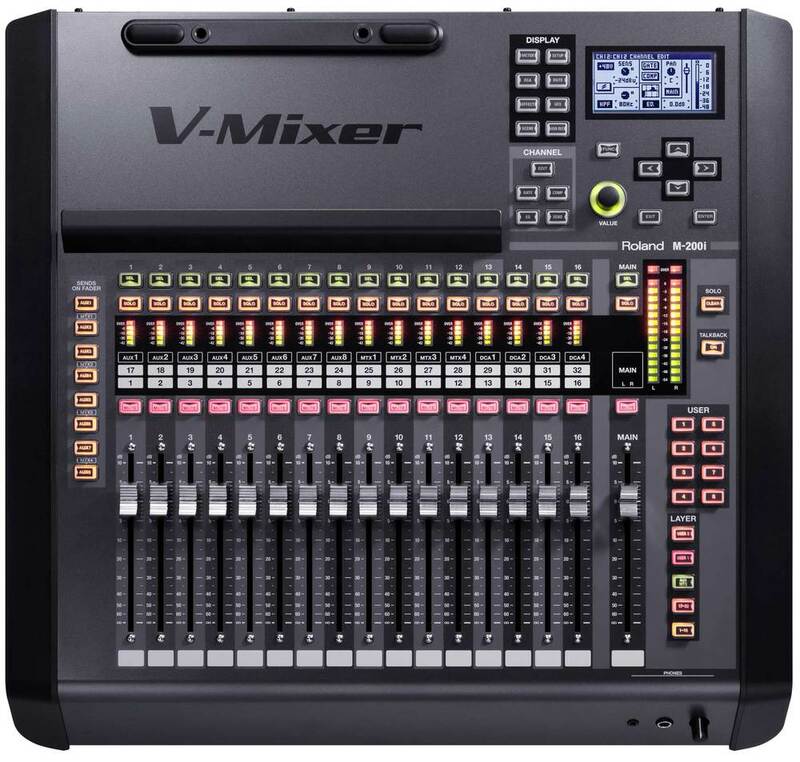 For now, we’re going to look at three mixers that look like perfect fits for the small- to mid-sized church (200-800 seats or so). Two of these three mixers are fairly new; the X32 recently started shipping and the M200i is expected to ship in January. The StudioLIve 24.4.2 has been around a little bit longer and has a dedicated user base. But how do they compare? Let’s find out. Note, this is a feature comparison only. At some point, I hope to get all three of them together for a sound comparison, but we’re going to operate under the assumption that they all sound good enough for this application. In this series, I’m not looking to call a winner. I’m simply running through the feature set of each desk. The reality is that each of these will be right for someone, but it’s unlikely that each will be right for everybody. Which one you choose will depend on what you need, and what you value. With that said, let’s get on with it. To start off, we’ll consider the work surface as that is how we’ll be interacting with the mixer most of the time. M200i: 16 motorized faders (configurable for input, output mixes, DCAs and user layers) plus 1 motorized master. The lack of motorized faders are a deal-breaker for many, especially if you’re using the iPad app (which is rather good). Once you make any changes on the iPad, you have to use a “fader locate” mode to position the faders on the surface to match the current levels. This is unfortunate. The M200i is a small mixer; it’s able to be rack-mounted. As such, the control surface does not have a ton of controls on it. Each channel has dedicated mute, solo and select buttons; there are 8 buttons for selecting sends on fader mode (pressing two of them will select the matrix mixes); there are 8 user defined keys; 5 layer keys; about 20 buttons for selecting various operating sections and controlling the small LCD display, and a single encoder. Though small, it’s easy to see and the navigation isn’t too hard. Each channel also has a 5-segment meter, while a larger meter keeps track of the L&R output. While sparse, it’s laid out well, and it is very easy to get around on. The X32 is a larger mixer, so it has more dedicated controls. Each channel strip has the mute, solo and select buttons plus a color-coded (user assignable) digital scribble strip and a 5-segment meter. Three buttons and two encoders adjust compression settings; a pair each of buttons and encoders control the gate; three encoders and six buttons mange EQ (four of the buttons select the band you’re working on); four encoders and buttons allow for easy aux mixing and a handful of other buttons and rotaries manage other tasks. They also included user-definable rotaries with digital scribble strips to manage often adjusted parameters (reverb time, for example). You also have six UDKs. And we can’t forget the iPhone rest. The X32 also comes with a 7” color LCD (non-touch) with some encoders and buttons to navigate the interface. It’s a little busy, but not terribly so. I’ve played with it at trade shows and it’s not hard at all to get around on. The StudioLive 24.4.2 is in between size-wise. The oddest thing about all the StudioLive mixers is the Fat Chanel. Using 24 encoders and a bunch of buttons, you can adjust the EQ, dynamics and aux sends of any selected channel. It’s odd because the layout is horizontal and the EQ display is not anything like what we’re used to. I’ve mixed on them and it takes a while to become used to what you’re looking at. I give them points for creative packaging, but I’m not really crazy about it. However, the Presonus is the only one to offer a dedicated gain knob for each channel. The other two have one gain knob and you select channels to activate. Because so many of the functions on the StudioLive are multifunction, the surface is littered with buttons. The display is very small and the interface is clumsy to navigate. Like anything, once you use something for a while you can get fast on it; but my initial impressions were mostly those of frustration. It’s actually much more useful when attached to a computer running the editor software. Like an 01V from Yamaha, I wouldn’t want to mix without PC or (preferably) Mac control. Well, we’re just getting started here. Next time around, we’ll dig into I/O, mix buses and built-in effects.